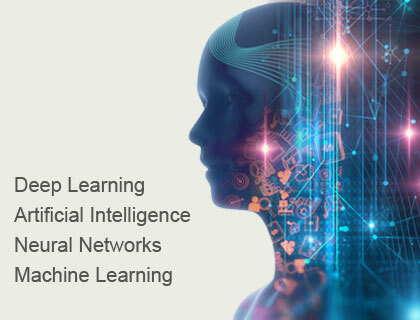 If you have not been paying attention you might have missed the fact there has been a huge technological breakthrough recently in the development of artificial intelligence. Computers are now capable of deep learning or self learning. Think of the movie Terminator where the machines were smarter than the humans and you really have a good idea of the technology we're talking about. In the past we gave the computer a set of instructions and variables that were programmed in. The system was only as good as the amount of data input. With the new technology the computer is actually learning like a human. Once it learns how to understand a subject, it then learns on it's own. 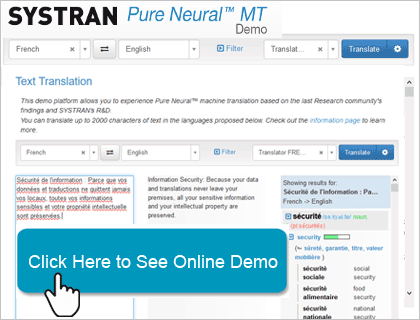 SYSTRAN has been working on this technology for a few years and has developed the world's first Pure Neural Machine Translation engine using deep learning methods. What's Different about Pure Neural MT? The major change of a neural translation engine (NMT for Neural Machine Translation) in the translation compared to current engines, statistical (SMT for Statistical Machine Translation) or rule based (RBMT for Rule Based Machine Translation) is brought by the artificial neural networks. Like the human brain, the machine learns through a learning process that can last several weeks in which it is subjected to a series of stimuli. This training, based on complex algorithms at the forefront of Deep Learning, allows the neural translation engine to learn, to generalize the rules of a language on the basis of texts already translated, and to produce a quality of translation close to the human or even higher in some cases. 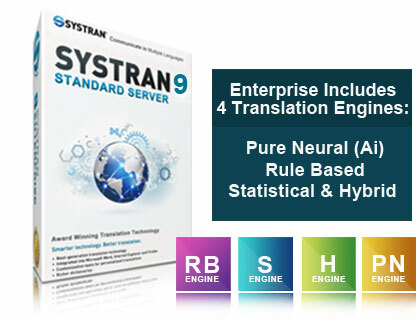 SYSTRAN's new Pure Neural Machine Translation technology is revolutionary in that it processes an entire sentence or paragraph in the context of the overall document topic, instead of translating segment by segment. This creates a far more accurate output than ever before seen in an automated translation software. Generic Neural Machine Translation is definitely a huge improvement in translation technology but Specialized NMT is the technology that will truly provide companies with a solution that is even more superior. With specialization, the potential of neural machine translation is highly enhanced. 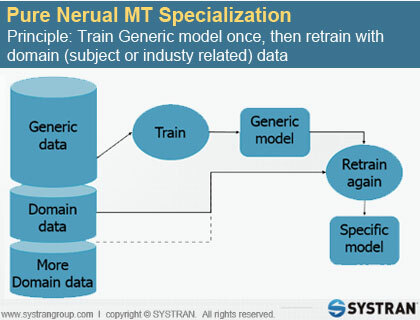 With its new PNMT™ engine, SYSTRAN can optimize neural networks in a post-training process called specialization. This method significantly improves the quality of translation in record time. In the past you trained Rule Based or Statistical translation engines with terms and phrases by building custom dictionaries. 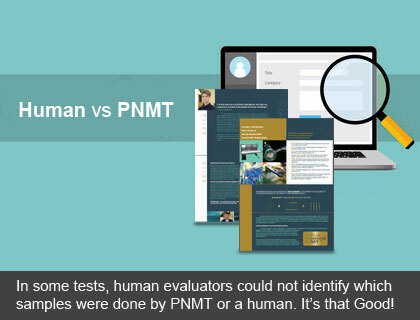 With the new PMNT this task is no longer required because the deep learning technology does all the work by learning the industry just like a human would, but even more efficiently. Current specialization models are already available and more are being developed daily. Additional specialization services are available for a client's specific domain. How Good is the New PNMT? This is new so there are some hurdles still to overcome but this is just the first generation that has been beta tested. PNMT will take more computing power than traditional engines but with the initial tests, and specialization the experts agree, this is a game changer and is the future technology that will be used for translation software..
.See for yourself the quality, read a SYSTRAN Brochure that was completely translated by the software with no post editing. What makes SYSTRAN's offering unique? Unlike in previous generations of engines where a huge volume of data was mandatory, the neural network feeds itself on enriched data. The quality and the wealth of these data largely count on their quantity. Test the new Pure Neural yourself! 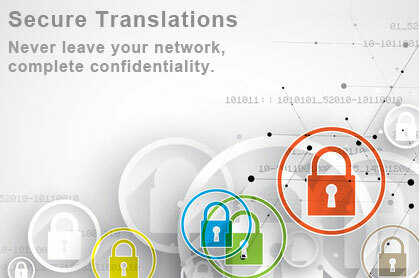 We are the only company to offer our customers complete data security. We understand confidentiality of documents is paramount for many companies. With SYSTRAN Enterprise Pure Neural MT, you can install on your own network behind your firewall. Your data and translations never leave your building, so all of your sensitive information and intellectual property is preserved. No internet connection is required. With the accuracy of Pure Neural MT there is often no need to even have translators look at your data. Keep things as secure as needed with SYSTRAN. 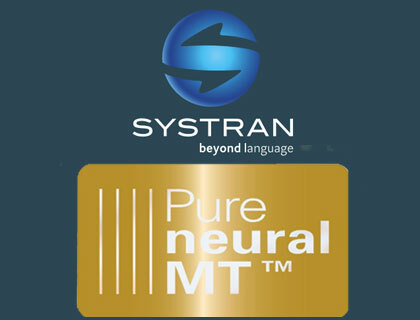 The new Pure Neural MT is included in our SYSTRAN Enterprise Editions. You can choose from the our existing powerful technology. -Rule-based components guarantee predictable and consistent translations, compliance with corporate terminology, out-of-domain usability, and high performance. -Statistical components learn from existing monolingual and multilingual corpora which drastically reduce customization costs and further improve translation quality within speciﬁed domains. -Hybrid combines the accuracy of rule-based and the fluidness of the statistical to create an engine that can deliver a higher level of accuracy than using a single technology. -Pure Neural MT- Trained on generic data this system will deliver the accuracy needed for many companies. Let us show you how this exciting new technology can start saving your company money on translation costs. We guarantee you'll be impressed! "The new PNMT™ technology offers unmatched translation quality and fluidity in the history of automatic translation." "There are still areas of improvement on which R&D teams are already working. This technology will undoubtedly open up new perspectives for translators and contributors in a globalized world," says Heidi Depraetere, founder of Crosslang. The adventure has only just begun… The technology is ready and the results are amazing. The next step for SYSTRAN is to deliver this breakthrough technology to its customers. Several of them have already been participating in a beta test program to give back feedback in real situations. Customers can expect a smooth and transparent change. The noticeable change is the quality of the output translations, and what a change! SYSTRAN's Enterprise is used by Symantec, Cisco, Airbus, Ford, Samsung, Toyota, BNP Paribas, Daimler, Barclays, Department of Defense, US Government, U.S. Intelligence Community, Nato, Interpol and Professional Translation Service Providers. SYSTRAN technology can also be embedded in a third-party solution: a software or a mobile application. In particular, SYSTRAN is the official provider of translation solutions for the S-Translator application, a default application on the Samsung Galaxy smart phones of the S and Note series, and of iTranslate, the most downloaded translation application on the App Store. Another example: the software provider EXPERT SYSTEM has integrated SYSTRAN into its COGITO® software, specialized in the analysis of Big Data. 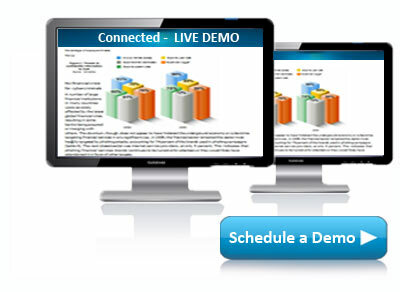 SYSTRAN Enterprise includes plug-ins that allow you to connect to additional technologies for a full turnkey solution.